Get free tools to increase Conversion! When you establish a digital start-up budgets are often very tight and yet it is important to have visibility of how your business is performing in the digital space and a strategy for conversion rate optimisation. When I advise start-ups on how to optimise their website the first thing I do is set them up with five free tools to begin this process. You can’t expect to understand how to improve something unless you have feedback and if possible you can measure it. This is an excellent web analytics solution that allows you to understand more about who your visitors are (e.g. demographics and device) and also what content is most popular on your site. If you have a blog this is essential as otherwise how will you know which posts are generating most interest from your visitors. Even if start-ups do have GA I often find they haven’t configured it properly and are getting false readings. Make sure you set up filters to exclude internal traffic by using your IPs and set a filter for language spam. You can also link the account to your Adwords and Adsense accounts. For more details see this post – I’ve installed Google Analytics – Now what? There are many web analytics packages on the market, but Google Analytics is one of a few that offers free permanent access to such a comprehensive and robust analytics platform. See my article on web analytics solutions for more details of how to use GA. Previously called Webmaster Tools, the Search Console is a comprehensive SEO tool for understanding how your site is performing in Google Search, but also what might be holding you back in getting more organic traffic. The Search Console includes a really useful dashboard (see above) which shows a graph of how many clicks your site has received from Google in the last 28 days, plus the number of site errors, including page not founds (404s) and the number of pages that have been submitted and ranked by Google. The console has five primary navigation elements that you should be checking on a regular basis. This is mainly more technical SEO data including structured data, rich snippets, HTML improvements and AMPs (Accelerated Mobile Pages). This provides data on search results, including clicks, impressions, CTR and average position. In addition it also shows number of external links to your site and what they link to, internal links, security issues and mobile usability issues. This shows the number of pages on your site that have been indexed, blocked resources and remove URLs. This section provides data on errors detected by Googlebots and the fetch as Google function allows you to submit a URL for indexing. The sitemap tab allows you to submit a new sitemap for your site to Google. Finally, the security tab tells you if have Google has identified any potential security problems with your site. For more in-depth instructions see my post; How to use Google’s Search Console to improve conversions. In 2017 Google’s introduced Optimize its free version of its testing and personalisation solution Google Optimize 360. 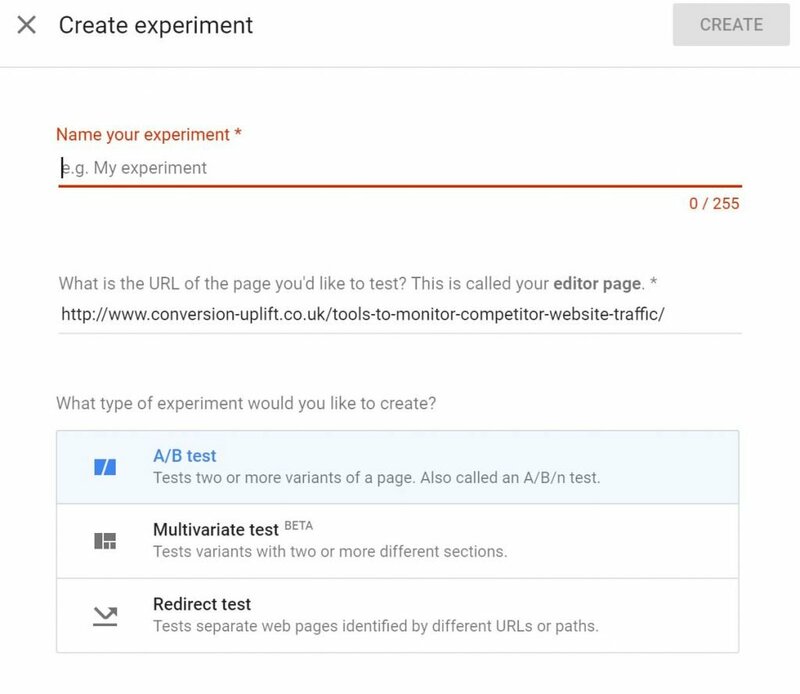 Optimize enables you to run up to 3 A/B tests (or multivariate tests) at a time and provides a includes a visual editor to set up simple experiments in a matter of minutes. It also allows you to run redirect experiments where you test a totally new page against the existing experience. As you would expect it integrates fully with Google Analytics. This is a simple but effective testing tool for companies not intending to conduct more than three simultaneous experiments or personalisation campaigns. It’s easy to use and is an ideal solution for start-ups that wish to use a data driven approach to website development. Read my post, How to get started with Google Optimize for more details of this free solution. Hotjar is a brilliant tool as it combines behavioural analytics, such as session recordings, with easy to use visitor feedback tools. Provided you have less than 2,000 page views per day you can sign up for their free basic plan. For sites up to 10,000 page views a day the start-up plan costs only €29 a month. The session recording and replay feature is something I love because it’s like watching an un-directed usability test and they can provide some great insights into the behaviour of users on your site. However, the free plan also allows you to create up to three click, scroll and movement heat maps, a six step conversion funnel and form analytics. That’s not to mention online polls, surveys to be sent to users, an incoming feedback tab and a recruiter feature for getting people to participate in user testing. This is an amazing free tool that no start-up should be without. Please read my review of Hotjar for more details. It’s important to remain in regular contact with your customers and prospects. Otherwise they can easily forget you even exist. Email marketing is one of the most effective and productive means of doing this. MailChimp provides a free professional email marketing service which allows you to send up to 12,000 emails a month to less than 2,000 accounts. MailChimp has a very easy to use and informative user interface which allows you to quickly create professional looking emails. To design emails it offers 20 basic layouts and over 300 templates using drag and drop technology. There is also an email editor for HTML and plain text alternatives to design your own template. It’s easy to import your contact list from a CSV or TXT file, copy and paste from Excel or import from an email marketing platform. MailChimp also offers comprehensive campaign performance metrics so that you can see how many recipients received, opened and clicked on your emails. It also advises you on how many email bounced and unsubscribed. Because it easily integrates with Google Analytics you can track how well your campaigns drive traffic to your website. MailChimp has now added autoresponders or what they refer to as automation to free accounts. These are automated emails triggered by an event such as registration, purchase or abandoned basket. This is a really useful feature that often you have to pay for to get access to. So, don’t delay, sign up to MailChimp today. These five free tools are a must for every start-up. Don’t be reliant on SEO or marketing agencies to provide these resources, you will learn much more if you use them yourself. If you do need help in setting these tools up I can offer assistance as part of my marketing consultancy service, Otherwise, don’t delay and sign up now to these invaluable tools to assist you in growing your online business.